We arrived in Orlando and started the first leg of our trip on Disney Property. Having had been to Disney a couple times we wanted to venture off and try different things and decided to stay off property as well. The townhouse is fabulous. It is in a perfect location, easy access to everything (All Disney Parks/Water Parks/Downtown/Seaworld Etc). We traveled as 2 seperate families and the layout was perfect with one Bedroom downstairs with a bathroom and 2 Bedrooms upstairs each with their own bathroom. Having our own private enclosed pool was also a nice touch. 2 Days during our stay we took advantage of the resort amenities clubhouse/gameroom/move theater (very cool has several showings and sits up to 40 people) and the main pool. Everything was very clean and everyone was so friendly as well as accommodating. One of the days the property had Gatorland come with some of their reptiles and did all kinds of things with the kids. All and all it was so nice to take a break from Disney and still feel on vacation. "A true home away from home", we would recommend it to anyone and definitely plan to stay here during out next visit to Orlando. Everything the Greco's provided was perfect! Their home is perfectly located (truly just a 5-10 minute drive to all of the Disney Parks!) It was great to come home and relax in a real "home" rather than a crowded hotel room. Having a washer and dryer was AWESOME! We stocked the fridge with a few essential items...milk...wine....and would have breakfast and a late dinner at the house after our time at the parks. I was worried about the drive/traffic/parking initially, but it was not a problem at all. Parking for Disney Parks is $14/day and you can still use the Disney transportation between parks if you choose. Windsor Hills has a great, centrally located pool with a small grocery store for essentials and a "snack bar". We only used our private backyard pool once~simply because we were too tired after days at the park~but the day we used it, it was great!! The pictures don't pay justice to the size of this place-It is BIG!! We misplaced our key code to get into the house and realized it when we arrived at the front door! Yikes! I called Kris and received a call back literally 2 minutes later! Thanks, Greco's for allowing us to use your "Mickey House"~we will be back and will certainly refer our friends that wander your way to stay there as well!! Our stay at My Mickey House was more than expected. It is encouraging to find owners that provide what they advertise on their site. The townhouse was great. There was enough room for all six adults, all rooms and furnishing were well kept, clean and comfortable. We all had good night sleeps, the beds were very comfortable. And the splash pool, I can't say enough. It was great to be able to come back after a long day and relax in the pool, right out the back door. The pool was well maintained and clean. The amenities at the community were great with the pool, snack bar, game room, and the ping-pong equipment. All community employees were very professional and courteous. i would definitely recommend this home to others for vacation and will consider staying again on my next trip to Florida. Finally, the most important item before, during, and after my stay was my activities with the property owner, Kris. She was friendly, helpful and quick to respond to any questions and needs. Besides the beautiful home and great amenities, Kris was the icing on the cake for our vacation ! This is our first time to rent a townhouse and our stay at our rental was better than we could have dreamed. The rental process was simple with better than adequate communication. the rental property was immaculate, we all had traveled a great distance and upon arrival, we all felt like we were coming to our own home. Our townhouse was in a wonderful location with easy access to all the parks and attractions. We liked it so well we will do it again in the future. Hopefully the exact same townhouse! We were extremely happy with this beautiful home. It was very clean and comfortable. Security was tight which was comforting. Close to all the main attractions. If we visit Florida again, we will surely stay there. We highly recommend this property to anyone visiting the area. Thank you - thank you - thank you! Your townhome was even more inviting than the pictures made it out to be. One of the main things that attracted us to your property was the child-friendly amenities, as our daughter had just turned a year old. We made use of the exersaucer, high chair, stroller and play yard and it was such a relief to not have to travel with those items. The comfort of having a home-like environment to come back to after the parks was very much needed and yet the location was convenient to everywhere we planned to go. 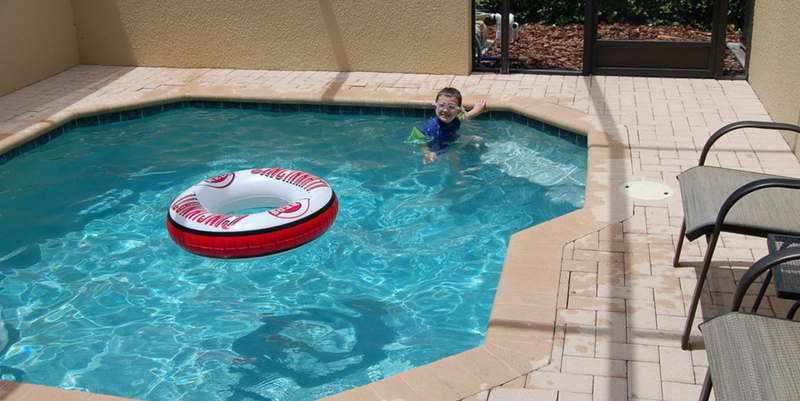 The entire resort was very well maintained and my six-year-old son had a blast on the water slide at the resort pool. From the moment I inquired on the property, all of your responses were prompt and thorough. No stone was left unturned and we truly felt like we knew exactly what we were getting when we arrived. So thank you again for making your property available and we will not hesitate in the future to book with you again. We are an American expatriate family of 4 (mother, father, 3-year old and 4-year old) currently living in Asia. We spent 8 days at My Mickey House in early February 2013. Real estate is about location, location and location. In terms of location, we definitely made the right choice with Windsor Hills. It is a beautiful gated community where security is efficient, helpful and not overbearing. The property is less than 10 minutes from the 4 Disney theme parks with Universal and Sea World only a little further away. For an expatriate family with lots of shopping needs, we were especially pleased that it was close to the full range of shopping from Target to outlet malls to high end shopping at the Mall of Millenia. However, our only regret is that as we were basically out from morning to night, we really did not fully enjoy Windsor Hills but liked what we saw during our brief tour of the common facilities (i.e. pool, clubhouse, etc). We were also very pleased with My Mickey House itself. Although there were only 4 of us (we were joined on the weekend by my brother in law and his fiancee), we really appreciated the extra space. We were glad that we rented the townhouse instead of a condo (the extra space is definitely worth the few extra dollars and is highly recommended). The townhouse was very clean and was exactly as represented in the pictures. It had everything we needed. Even though we did minimal cooking, the kitchen was sufficiently stocked for anyone who wanted to be master chefs while on vacation. With little kids and lots of changes of clothes, we appreciated the new washer and dryer. However, the thing that makes My Mickey House stands out the most is Kris Greco. She understands customer service and is very responsive. From the quick and efficient communications, it shows she cares that her tenants have a positive experience in her townhouse. You will love dealing with her. The best recommendation is a referral and I will definitely be referring Kris's My Mickey House to my friends. Absolutely Perfect..NEVER Stay In Hotel Again !! My family and I visited Florida this September (2012) for a week of Disney, Sea World, etc. We had arranged to stay at the "Mickey Mouse House" (as my daughter called it) and had a fabulous time. Everything from setting the reservation to arriving and enjoying ourselves was extremely easy, straight-forward, and the homeowner was very professional and friendly with the entire process, as well as helpful with finding nearby grocery stores, restaurants, etc. Driving into the gated community I was pleasantly surprised by how beautiful and perfect it was! When we arrived to the house, it was very clean, warm and welcoming. They had everything we could have needed...high chair, pack 'n play crib for our baby, even a fun activity chair for her to play in while we swam in the pool! My mother flew out to Florida as well and met us, which was one of big reasons for us looking for condos vs a hotel room...more space and more privacy. Up until this point, our accommodations have always been hotel, however, we will NEVER go back to that again! This gave our family the space to spread out with our own rooms and our own bathrooms, the fully furnished kitchen allowed us to buy all our groceries for the week which saved us a TON of money on eating out and buying food at the parks, and both of the pools were a hit with my 3 year old! We had one day of no plans and I researched for things to do that were affordable AND enjoyable to do with a 3 year old and 6 month old. We ended up staying at the condo and going to the main pool...what a treat! We had a blast! There was a large pool with a slide, a little snack shack to get drinks and food, a playground, and a huge game room and movie theater to enjoy as well. We had a fantastic time and DIDN'T SPEND A DIME (which is super great as a young family of 4 trying to get the most out of our trip to Disney). The private pool at the condo also worked out great for the breaks in the day or evening when the little one needed to nap. We were able to lay the baby down to sleep and still enjoy fun and playing right out back with our 3 year old. At night, we were able to put the kiddos down and sit out back by the pool enjoying the evening and on our last night, I was able to wash all our laundry with the onsite washer/dryer and pack everything CLEAN!!! Seems so minor, but the last thing a mom wants to do after a week long vacation, is go home and do laundry!!! Another great perk about staying at the "Mickey Mouse House"
© 2019 My Mickey House. All Rights Reserved.